Whether you are looking for a fun get-away, a special romantic occasion, a base for exploring Dorset or a family beachside holiday. 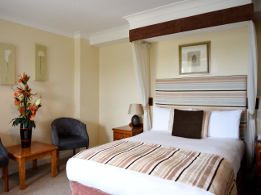 The Riviera Hotel & Holiday Apartments in Bournemouth offers you an enjoyable and relaxing time. Our family-owned Bournemouth hotel is proud to have welcomed generations of guests who value friendly service, excellent food and great spa & leisure facilities. Take a dip in our indoor pool or unwind in our new relaxation room equipped with comfortable seating and cosy furnishings, whilst you’re there, why not visit our Coast Spa for some extra pampering? If you prefer something more energetic, our studio gym can help burn off extra energy! A fun games room will keep the children entertained in a safe environment while you enjoy a drink in our stylish bar with spectacular views across Bournemouth Bay or, if the weather is kind, our garden and terrace offers a quiet retreat where you can sunbathe on the lawn whilst drinks are bought to you with our text to order service. For delicious food, book a table in our award winning Cunarder Conservatory Restaurant and experience high levels of creative cooking together with excellent service. There are many Bournemouth attractions all within walking distance. Stroll along the promenade or catch the Land Train to visit the Pier and the Pleasure Gardens. Walk through the wonderful Alum Chine to the fashionable Westbourne village, with its high Victorian arcade of restaurants and boutique shopping or simply wander along the clifftop to admire the views of the Isle of Wight and Old Harry Rocks. We are also close to Poole and its Historic Quay which is home to Brownsea Island and the famous Sandbanks – one of the most expensive places in the world to live! 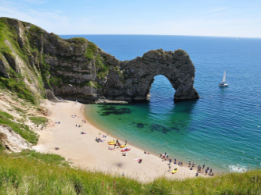 If you want to venture out, Dorset has some iconic places to visit such as Lulworth Cove and the Jurassic Coast – whatever your plans our hotel is in a central location and We will do our best to help you plan the perfect stay for you. Romantic weekends away, a chance to Discover Dorset or half term breaks with the kids. The Riviera always have a special deal for you! Check out our festive Christmas and New Year Breaks! 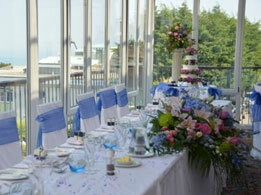 Riviera Hotel Alum Chine is the perfect wedding hotel in Bournemouth for your wedding venue. With romantic sea views and a short walk to the beach, you can rely on us to ensure that your Wedding Day is a huge and memorable success. Check out our Afternoon Tea Wedding for £1500! What better place to celebrate the end of a busy year with your friends or colleagues than at The Riviera Hotel Bournemouth. 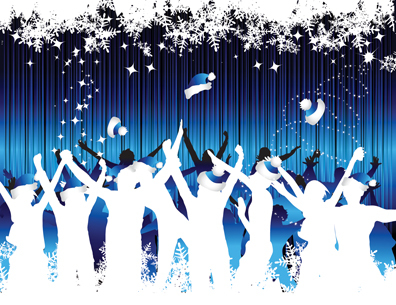 We offer one of the best Christmas party 2019 deals in Bournemouth and Poole and packages tailored for you.